Our recent trip to Europe this year was extra special because it was the Big K's golden birthday treat (though his birthday isn't until June). If you are a regular visitor to our blog you already know that the Big K and I are big on celebrations. No, not the party kind of celebration but the going-away-someplace-special kind of celebration. We always try to make it a point to go somewhere to spend our birthdays and anniversaries. Uh-huh! Itchy feet we have. And as luck would have it or one can also say it was an early birthday gift as the Big K was given more time off from work than we had originally planned for. We were able to stretch our trip to 3-weeks adding two more cities to visit on our original itinerary. Ah! The beauty of DIYing one's trip! We were booked on the season-opening trip of the Venice Simplon Orient-Express train from Venice to Paris. The train journey was one of the highlights of our trip which I earlier wrote about here. The package also included a 2-night stay at the luxurious Hotel Cipriani. But the Big K and I wanted to do a little bit more sightseeing so we decided to arrive a day early. After travelling for the bigger part of the day that included a 15-hour flight and a two and a half hour train ride from Milan, we finally arrive in Venice. Aah! Beautiful Venice! A city known for its canals and bridges. It is also a UNESCO World Heritage Site. The first thing we saw outside the busy Santa Lucia train station is the famous Grand Canal. boat traffic that is, along the Grand Canal. The Rialto Bridge spanning the Grand Canal is the oldest bridge in Venice built in 1591. We stayed at the Hotel Al Ponte Dei Sospiri on our first night. gondoliers singing as they passed right by our balcony. Yup! We were definitely in Venice! The Bridge of Sighs is an enclosed bridge with two windows on each side that was built in the 1600. It links the Doge's Palace with the city's prison across the canal. It was mainly used to take the prisoners interrogated at the Doge's Palace to their prison cells. The name of the bridge came about as prisoners were led to their cells they would look out of the windows for their final view of Venice and sigh. Our 3-day stay in Venice was basically cut to two days of sightseeing since we arrived quite late on our first day the remainder of which was spent walking around and getting lost in the back alleys of tourist central, San Marco. The Big K and I are the lingering type of travelers. We like to take our time to see a place and enjoy the moment. No Amazing Race for us, thank you! Since we only had two full days in Venice we had to make a list of all the tourist attractions and choose the ones that interested us the most. Hopefully we get to go back in the future so we can visit the other must-sees in our list. Here's keeping our fingers crossed! So we chose to do the following: a visit to the Doge's Palace and go on the "Secret Itineraries" tour (Palazzo Ducale Itinerari Segreti). Being book-lovers we just had to drop by the Libreria Acqua Alta plus they have cats (did I mention we have 15 fur kids of our own? Uh-huh!) and lastly a day trip to the islands of Murano and Burano. The Doge's Palace with Saint Mark's Basilica peeping on the left side. The Courtyard of the Doge's Palace. The Big K and I typically go our own merry way when visiting tourist attractions. We seldom avail of tours offered by the local tourist board unless it's something worthwhile. During our preparation for this trip, we would always come across the Secret Itineraries Tour offered by the Palazzo Ducale (Doge's Palace). The tour is highly recommended and it takes one inside rooms and chambers of the Doge's Palace not open to the general public. Plus the story of one Giovanni Giacomo Casanova (yup! That Casanova) totally intrigued us. And, yes, the Secret Itineraries Tour is definitely a two thumbs up! would flood the whole city. In every trip we take the Big K and I try to have a taste of the local food. So Venice being a coastal city, we definitely had to try their seafood. 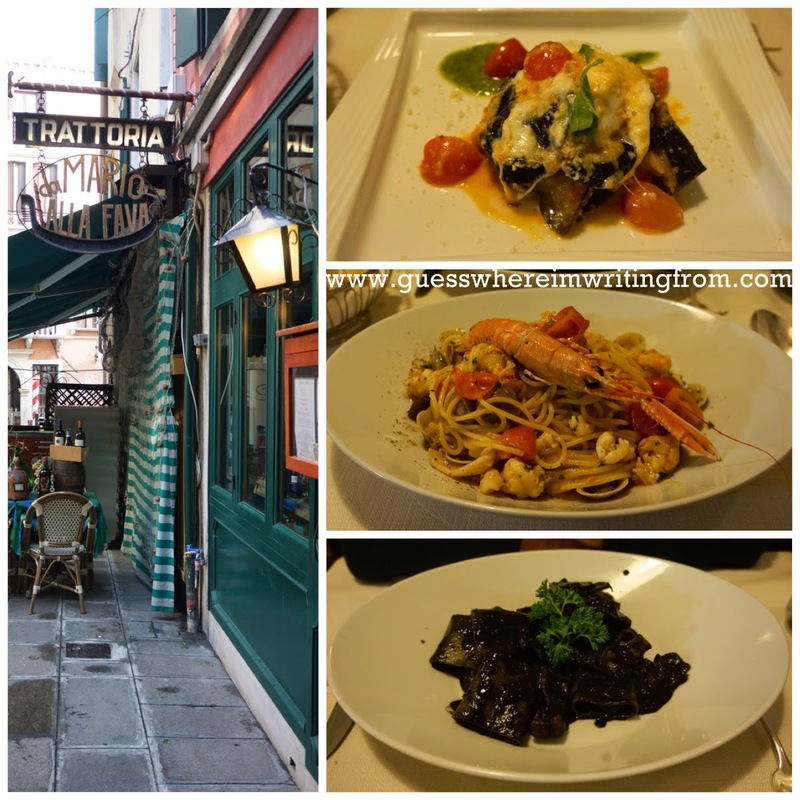 Walking around San Marco, well more like getting lost in the back alleys of the sestiere, we found this trattoria well-away from the usual tourist track. Venetian style. Oooh! So yummy! Time to walk off that huge lunch and on to our next stop! bookstore. Did I mention they have cats? Steps to a higher learning? Next post: A day trip to the islands of Murano and Burano. More photos of Venice in our Facebook page.